I think knitting is my nesting. And, well, nesting is my nesting. And perhaps knitting is my break from all that exhaustive cleaning and tidying and rearranging. For, you see, my second labor is looking likely to be much like my first (read: complicated), and I have this urge to put everything right and lovely just in case I, well...die. Oh, that sounds so terrible and even worse when written down, but it's a major motivational force; something akin to having on clean underwear (which I assure you I most certainly do. My hair and shoes will likely be dirty, buy my undies - and now my house - clean!) As the little girl around here says: clean. nice. dry. It is also said little girl who has a drawer full of sweet old springtime dresses picked up by her thrifty mama, but who instead wants only to wear her rather garish Christmas footed pajamas all day, every day. Never mind that within 5 minutes of playing, they are covered in dog hair, certainly offending my nesting sensibilities. I may have no control over wardrobe choices, but at least I can manage to contain some of the animal messes. The fowl have all been banished to the garage (don't worry, they still get loads of visits and attention each day), and are growing so quickly that they should be out to pasture soon! 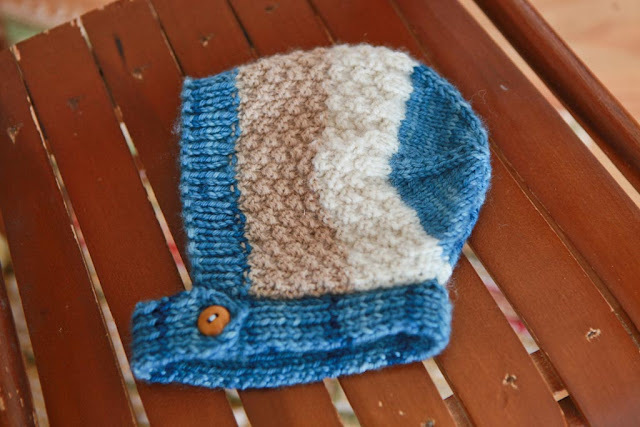 Onto the knitting: I finished a hat for baby-boy-to-be, much like this one, using all the bits of leftover yarn from the longies I knit awhile back. I might not be able to resist making a bear hat like this one as well. I'm working on a blanket now, also from the Vintage Knits for Modern Babies book, although it only gets attention late at night or when the weather doesn't permit us to be outdoors working on the garden. Today is shaping up to be beautiful out - a bit sunny and a tad warmer - much unlike yesterday, which was very cold with a foot of snow and still falling. It will mostly be melted today, though, if you can imagine that - it's what we call Springtime in the Rockies! Jaime, I hope everything goes well with this baby. I imagine your home is spotless - the nesting urge plus the spring cleaning urge! Lovely knitting. I really like that book. You will do wonderfully. No doubt. Lovely knitting! Its good to be prepared...just in case....but I am sure it won't come to that!! Take care all of you and enjoy this wacky spring weather! Love that little knitted hat! I hope your second baby enters the world smoothly. I had a very tough and scary delivery the first time around, but I just have this feeling that things will go more easily this time. Crossing my fingers for both of us. All the best this time around to you too, Lilly! Jaime, your knitting is lovely. Such special things for the baby. Fingers crossed for a much smoother labor this go round. I know what you mean about complications, though I never made it to the labor part. I made the Vietnamese yogurt last week. I think it is my new favorite home made yogurt. Thanks for sharing. Oh good! I'm so glad you like it. I had a baby in December, and in the month I took off work before giving birth, my house was SO organized and clean! I took pleasure, every day, in making all the beds (I have three older children), and in the evening, putting every single piece of laundry away. I think that fear of dying in labour thing is a primal and very natural fear, as much as we hate to talk about it. I've had four babes and every single time, I was sure I was dying. You're in my thoughts as you prepare for your birth...such a special time! I laugh now when I look at the endless piles of laundry that sit in baskets in the kids' rooms, unfolded and unsorted, and how hard it is to even get a cup of coffee let alone do the dishes or obsess about how tidy the house is. The baby doesn't care, and I'm learning to let it all go for now. 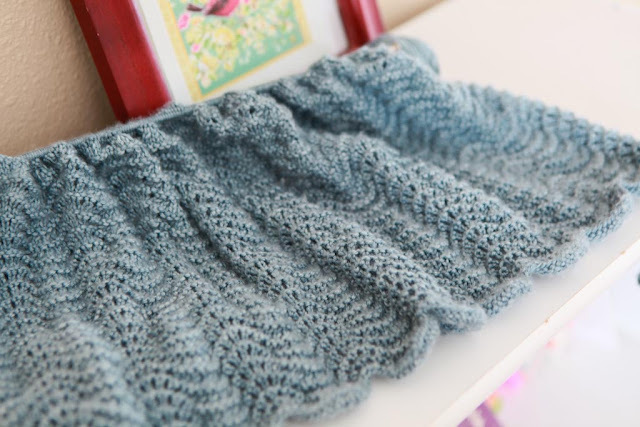 Your knits are gorgeous! 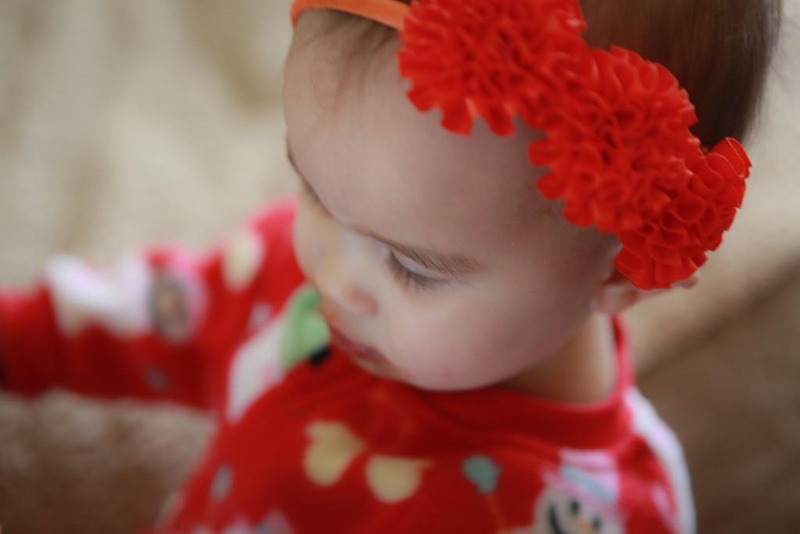 I was so happy to put my baby knits on my real-live baby after she was born! She was my first winter baby (I'm in Canada so we had a dusting of snow this morning, too!) and looked so sweet in all her hand knitted garments...hat, socks, vest, sweaters! Thanks so much, Rhonda. Due in mid-June! Jaime, it's such a crazy time those last few weeks, no? The emotional roller coaster, the intense nesting, the (sometimes) irrational thoughts, the discomfort, the fatigue coupled with the wild bursts of energy, the bizarre prioritizing... my husband learned not to mess with it - he just sweetly let it all unfold... :) Those last 6 weeks are spent "working out" all our fears and worries, and on top of that, we face our own mortality "square on". Thank you sweet friend, for your wise words.